"Can you see why a knowledge of history is important - so that we can see the issues as our Lord presented them against the whole backboard of history and to see the battle as it is again lining up? Because again we have the tragic view of ancient Greece; again we have the Persian view - tolerate both good and evil; again we have the Assyrian-Babylonian-Egyptian view of chaos as the source of regeneration. And we must therefore again find our personal and societal regeneration in Jesus Christ and His Word - all things must be made new in terms of His Word." 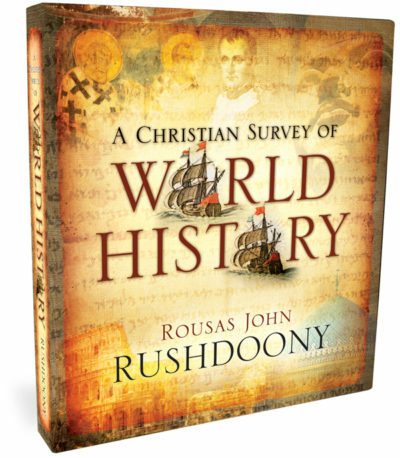 These lessons give an overview of history from ancient times to the 20th century as only R.J. Rushdoony could.